365 Challenge Day 155 – Zumba! I went to Zumba tonight for the first time in months!! I missed it!! Our teacher is so enthusiastic and over the top she just makes it ridiculously fun for everyone. She had us do a soul train in the middle of the class : ) By the end of the class my cheeks always hurt from smiling so much! Plus, I’m paying $35 a month for this gym (even though I have a gym at work!) mostly so I can go to this class!! I made an awesome and simple vegan meal that I’ll be eating all week long. I sauteed a ton of veggies and added tomato sauce, zucchini, summer squash, carrots, celery, broccoli, and mushrooms. Then I made a mixture of tofu, vegan cheese, garlic powder, and parsley, and broiled the veggies with the tofu mixture on top. Served this over brown rice noodles. It’s kind of like a simplified variation of lasagna. It turned out good!! In Buddhism there are three “poisons’ that cloud the mind and lead to suffering, greed, aversion, and delusion. And people have personality types fall predominantly into one of those categories; there are greedy types, that walk into a room and see what they like (and want); there are aversive types that walk into a room and see what they don’t like and don’t want; and the delusional types that barely notice they are in the room, there mind is someplace else. I am, without a doubt, a greedy type : ) And as such, sometimes have trouble with moderation. When I like something I really like it, and tend to overdo it. I went running again tonight, it was really awesome. It was a cool and overcast day, which was nice. I ran for 20 minutes and the time when by really fast. I ran into a good friend after and we walked for a while to catch up. That would have been a good evening. BUT, because I had such an awesome Zumba class on Tuesday, I wanted to go again! So from running, and then walking, I went straight to Zumba class. Probably not the best idea. I told myself I’d take things slow! I didn’t injure myself, but my back does feel really tight, we’ll see how it goes. Last week I had a couple of days I could barely bend over or walk after I overdid it with the running. I’ll be sure to do lots of stretches! The good news is I cooked today!! I made something slightly inspired by lasagna, but with spaghetti squash instead of pasta, and tofu mixed with Daiya vegan cheese and herbs, and sauteed zucchini, summer squash, portabello mushrooms, onions, and garlic. I put it all together and baked it for 30 minutes. It is delicious if I do say so myself!! 365 Challenge Day 33 – ZUMBA! I had a bit of a tough day yesterday, and going to Zumba made my day. The music, the dancing, and the enthusiasm were just what I needed. I was beaming ear to ear. Whenever I go to Zumba my cheeks ache at the end from smiling so much. The hour always goes so fast, it’s unbelievable. I also had my weekly meditation group at work. We did 25 minutes. It really did feel like this little peaceful refuge in the middle of a hectic day. It’s good to remember that is available to me whenever I want it. 365 Challenge Day 22 – Zumba! I LOVE Zumba. But, I didn’t actually make it to class tonight. The class I go to is so awesome, so fun, and the teacher so popular, that even though I called an hour early to reserve a spot, I would have been 16th on the wait list!! Zumba is the perfect cardio for me! I love to dance, but the amount of exercise in a regular dance class is hard to control. The classes I go to will often have 60 seconds of intense cardio while doing a step, and then 4 or 5 minutes of waiting for another turn while others go. And some of the steps might be slow. Basically, the point of the class is creative expression, not exercise. Zumba is dance, but with the express purpose of keeping it moving!! The teacher I love is totally over the top. She jumps all around the room, cheers, yells, pulls people up to the front of the class to demonstrate, has us doing dance battles and shaking our butts in each others’ directions, it’s fun and hilarious. The class is always packed! The Zumba slogan is “Ditch the work-out and join the party”, and that’s exactly what it feels like!! The hour flies by, and by the end my cheeks hurt from smiling so much. 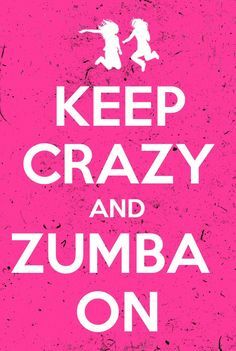 I had been to Zumba before, and always it was okay, more fun than running on a treadmill, but not nearly as fun as a real dance class. The students seemed to be mildly going through the motions, the teachers were good, but not as interactive. Well, when I tried this class because a friend kept asking me go, it changed everything!! I quit my gym and joined this new one, just so I could go to this class!! I feel very grateful that I have found ways to exercise that not only keep me healthy and active, but that I actually enjoy and look forward to!! Next time I’ll remember to call 2 hours ahead of time!! Well, no one showed up for lunchhour meditation group today, so I took the opportunity to go for an hour long walk outside along the river, it was a beautiful day. This blog is turning out to be much less about yoga than I thought it would be, but I am keeping active and healthy, so far so good.